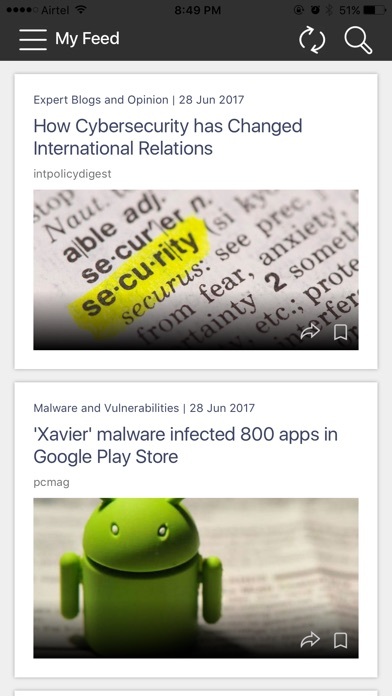 Cyware is a first of its kind App for cyber security professionals and general users to stay informed about the happenings in the cyber world with expertly curated cyber security news stories. Communication and Information Sharing are integral parts in security culture and critical components for employees to become active in any organization’s security efforts. Cyware offers several niche features that have never been offered in mobile environment. SMART STORIES: Cyware presents to you only the best from tens of thousands of Cyber stories published daily. These stories cover the entire spectrum of cybersecurity news and leave you with an enriched cyber awareness. SMART VIEW: The Cyware Consumer App is now loaded with a new feature, ‘Smart View’ that allows the user to read from the source URL much faster and with more ease by producing the relevant content for quick and smart consumption. EASY ACCESSIBILITY: Cyware Consumer app is now designed per Feed Interface. The user can easily scroll through the cyber news feed section for quick perusal. SPEED READ: The Feed Interface allows the user to quickly read through the important cyber news as and when they arrive thus inculcating real-time situational awareness. CYBER ONLY: We retain the essential facts on most important need-to-know Cybersecurity matters while providing access to the original news source. SITUATIONAL AWARENESS: You will stay informed with happenings in your network and share information with your trusted partners. 2. Internet Security: Cyware provides latest Internet Security news that covers scams and frauds, security tips and advice, information on cyber attack and threats related to the Internet of Things among others. Internet Security news comprehensively covers the entire cyber security news paradigm for internet. 3. Mobile Security: Cyware provides latest Mobile Security news that covers various aspects including safety tips, and new smartphone malware and vulnerabilities among others. 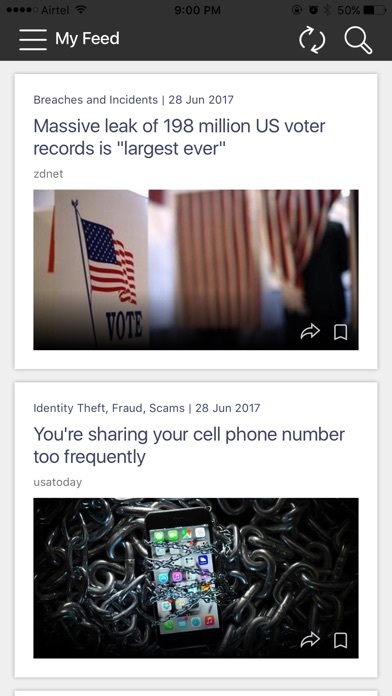 Mobile security news comprehensively covers the entire cybersecurity news paradigm for mobile phones. 4. Information Security: Cyware provides latest Information Security news updates that cover the triumvirate of CIA attacks viz Data Confidentiality, Integrity and Availability and the breaches and attacks along with learnings, incident response and solutions. 5. Computer Security: Cyware provides latest Computer Security news that covers both the general and particular aspects of cyber security including the cyber hygiene, safety practices, awareness about cyber attack, product information and general awareness. Building security culture is a collective effort. Everyone – including executive leadership and management, cyber security team, and company employees - all play key role in establishing cyber security culture. That is why it is important for everyone in the chain to be aware of what is happening in the cyber world and have collective knowledge of adversaries, threat methods, attack vectors, motives, and targets. 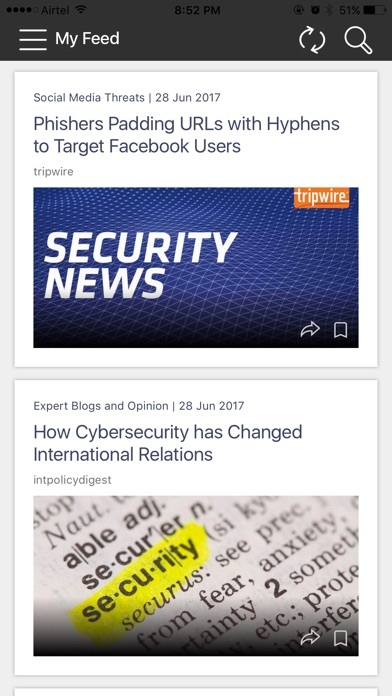 Be it the latest cyber security news trends, innovations, tools, strategies or opinions, we bring to you the most up-to date and relevant news articles. We help you stay informed about major breaches and incidents, new malware and vulnerabilities, threat intelligence, cyber analysis, and laws regulations thereby helping you gain security awareness.